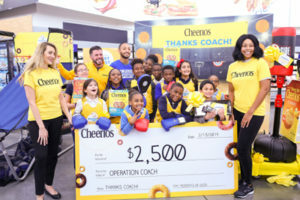 Recently, Cheerios Cereal teamed up with Walmart to host a friendly Pop-a-shot competition at the store (3200 NW 79th S.t, Miami, Fla., 33147) to raise awareness and funds for the Overtown Youth Center. There, young athletes surprised their coach, Miles Chinn; an American veteran with a passion for empowering young people – to thank him for his work in the community. Cheerios, which is on a mission to spread goodness and positivity from coast to coast, honored Miles for his work as well. Alongside Walmart, the brand presented Miles with a $2,500 check along with sporting equipment and basics (valued at $3,000) – all to benefit the Overtown Youth Center.